INDIANAPOLIS - The 2015-17 Grand Council of Tau Kappa Epsilon was elected at the Fraternity's 58th Conclave in New Orleans. Following, Past Grand Prytanis Bob Barr passed his jewel of office and gavel to newly elected Grand Prytanis Rodney G. Talbot. An energetic and excited crowd of friends, collegiates and alumni warmly welcomed the elected Grand Council. Fraters Rodney Talbot, Christopher Hanson, Ted Bereswill, Dr. James Hickey, Brian Montgomery, Fritz Jacobi and Tony Clemens will continue to serve on the elected council for the next biennium, while Frater Ryan Vescio became the new addition to the Fraternity's leadership. 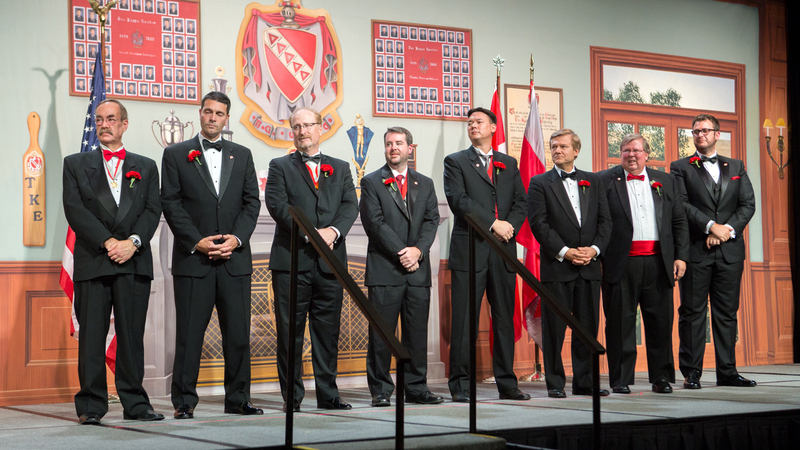 Learn more about the new Grand Council at tke.org/about/grand_council. Any eligible alumnus wishing to present himself as a candidate for the Grand Council must submit a professional resume, TKE resume and a vision statement for Tau Kappa Epsilon to gc@tke.org by August 31, 2015. After applying for the At-Large member position, candidates will be required to submit to a background check and must complete a conflict of interest questionnaire and acknowledgement statements.